Over 25,000 businesses now use ClickDesk to convert their web visitors to happy customers through fastest live chat, voice chat, help desk and social toolbar. ClickDesk, a leading provider of Multi-channel customer engagement solutions to businesses, today announced it is celebrating its first anniversary. Launched in June, 2011, ClickDesk has grown exponentially and has attracted over 25,000 customers worldwide. “We are thrilled to celebrate our first anniversary together with our 25,000 customers who have trusted us since the start, allowing us to equip their business with leading edge multi-channel customer engagement solutions,” says Manohar Chapalamadugu, CEO of ClickDesk. Unlike other software that requires downloading and installation of software, ClickDesk integrates directly with IM such as Skype and Google Talk to provide a clever combination of live chat, browser phone capability and a social toolbar which enables client-communication directly on a website. The built-in voice chat functionality allows visitors to call businesses through Browser phone, Skype or Local Access numbers available in 40 countries. The social toolbar lets users Tweet or like a Facebook page right from the chat window. In June, ClickDesk launched a help desk service to public, a new capability for businesses looking to more efficiently manage support e-mails and offline chats. The new help desk service was designed for businesses who are not interested in a full-blown help desk, but still want to take advantage of useful features such as live chat, built-in phone and a social media toolbar. ClickDesk also offers a world-class plugin for Wordpress at no cost which provides users with a live chat service. Collectively, ClickDesk offers more than 20 plugins and integrations with all major CRM, billing and e-commerce platforms. 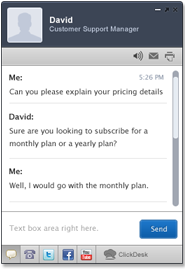 Clickdesk offers a free plan with all major features, while paid plans start at $9.99. To learn more about the product or to signup, please visit http://www.clickdesk.com.